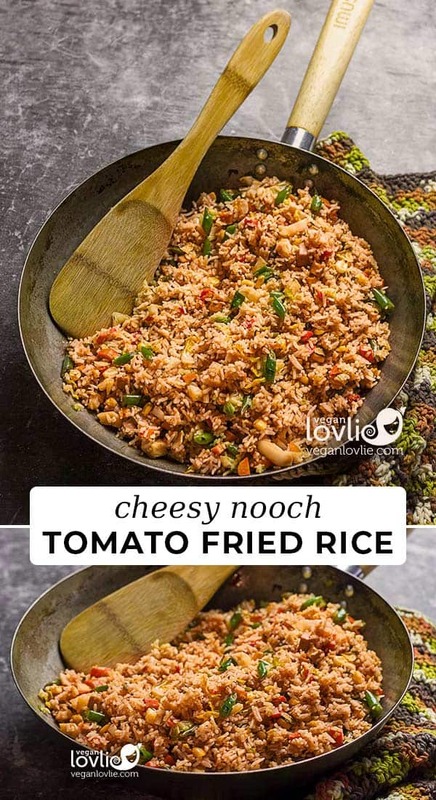 Cheesy Nooch Tomato Fried Rice is a beautiful version of the classic vegetable fried rice dish with amazingly complex flavours from the tomato, nooch (aka nutritional yeast) and herbs. This delicious crowd-pleaser vegan rice dish is prepared in little time and can be served as a meal in itself. 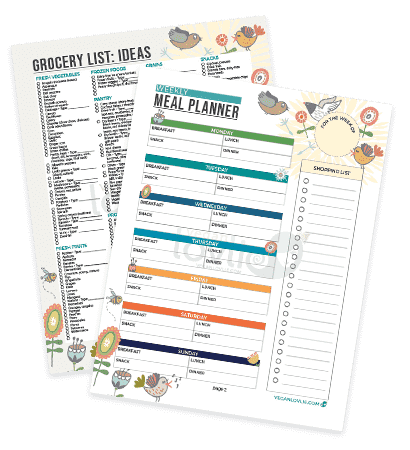 Every home cook probably has a few meals up their sleeve that they can put together without a recipe. 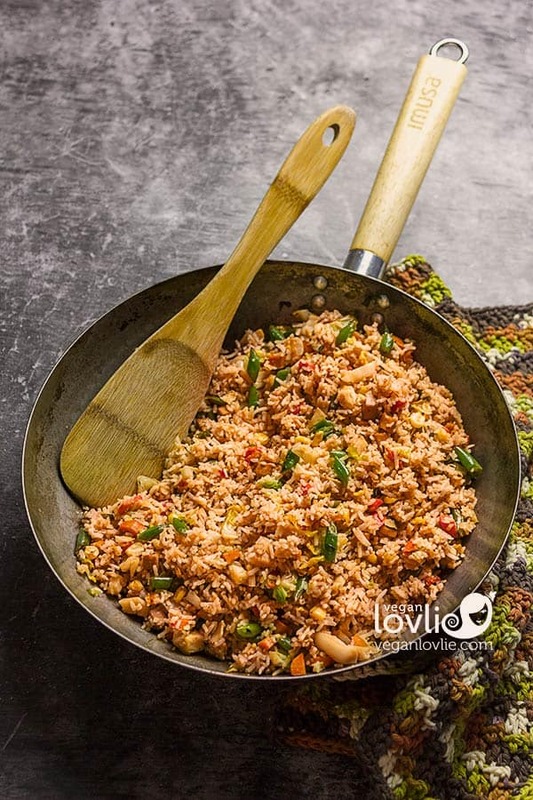 At our place, one of those recipes is vegetable fried rice; we make it so often that it is just a matter of stir frying vegetables with day old rice, some sauces and selected spices. That said, most of the time we make fried rice intentionally and not just to clear the fridge from leftover rice and vegetables. More often than not, we are cooking the rice on the same day. If you’ve been following this blog or our YouTube channel, then you probably already know that stir-fried dishes are Kevin’s specialty! 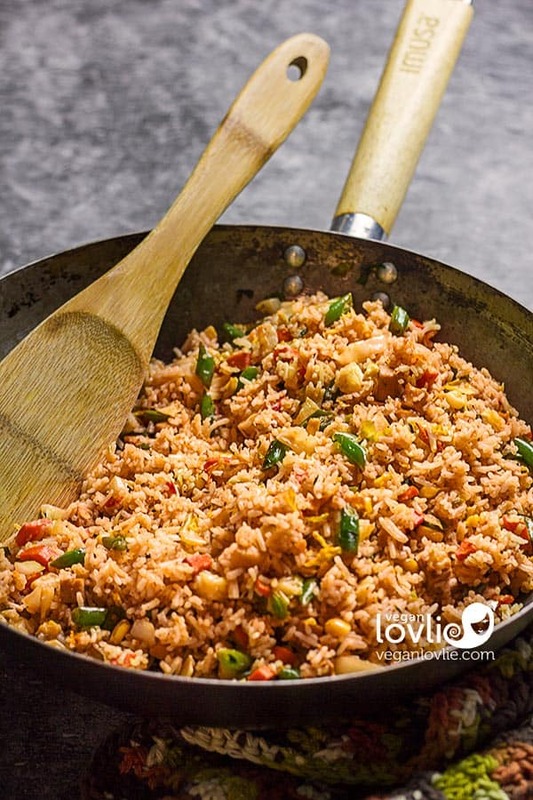 This Cheesy Nooch Tomato Fried Rice is one of his many delicious dishes that I dote on! So, this time I had to grab the recipe from him. What really makes this dish is the combination of flavours that ticks all the six taste categories of salty, sweet, sour, pungent, bitter and astringent – nooch, maple syrup, tomato, paprika, selected herbs and the choice of vegetables like Brussels sprouts, carrots and green beans. 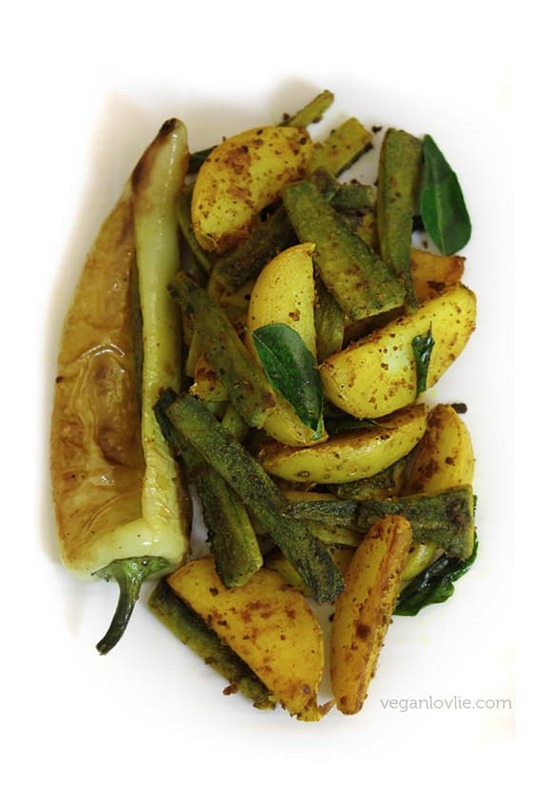 Most of the time, we base our cooking around a balanced combination of the ayurvedic six tastes in accordance with what our body needs at that given time. In fact, many of our recipes are carefully thought out to reflect this. Such an approach in our cooking has brought many benefits to our health, keeping our energies balanced. On a side note, if you’re interested in this approach in cooking or would like expert advice, I’d like to introduce you to a friend of mine, Kristina from Blissfud Ayurveda who is a Board-Certified Ayurvedic Health Counselor. She offers online ayurvedic consultation and advice on what foods will work best for your dosha or body type (according to the ayurvedic system). I’ve been following her on Instagram too for a while and I love her radiance, energy and approach to life in general. This week I was amazed by her mud home that she built with the help of 600 members of her community in Panama. It’s simply incredible! So, back to our nooch tomato rice recipe. Nooch is also known as nutritional yeast. 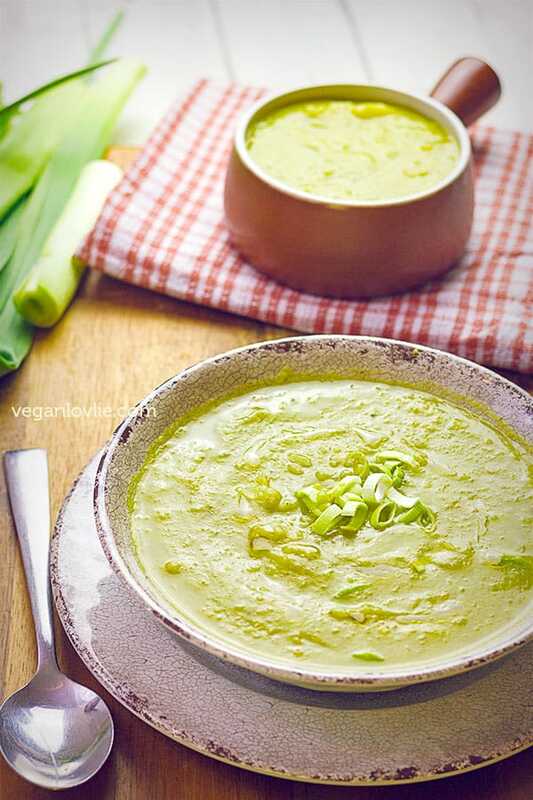 It’s a deactivated yeast that adds a savoury cheesy flavour to dishes. It is a staple in our kitchen and there has already been many recipes on the blog that calls for nooch. If you’re vegan or avoiding dairy, you would probably not want to miss nutritional yeast in your pantry. I buy my nooch online because I love this one in particular on Amazon.ca. This one-pound jar lasts me more than a year! Also I’ve noticed that the nooch from some brands give me a little bit of an irritated bowel, I don’t get this problem with this brand. Nutritional yeast is available at health stores or bulk stores and depending on where you live, many regular grocery stores also carry it nowadays. Whether we are using day old rice or freshly cooked, the important thing is to use cold rice. During Winter, we place the freshly cooked rice to cool down outside in the snow. It works brillant! Since we have free access to amazing natural freezing facilities for five whole months in Canada, right outside from the balcony, we might as well use it, right? The almost frozen rice is perfect to cook with. During Summer, we just leave the rice to cool and sometimes place it in the freezer for about 15 minutes. 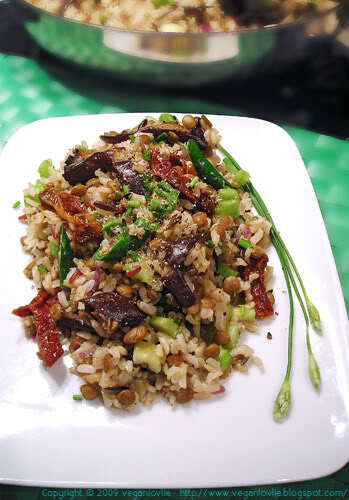 If you watch the video for our previous vegetable fried rice dish, you’ll get a visual hang of the process, even though the recipe is somewhat different. Kevin has a wonderful technique to make fried rice with freshly cooked rice so that it doesn’t turn mushy. Rinse and drain the rice a few times until the water runs clear. Add about 4 cups water to the rice in a deep saucepan and bring to a boil on medium-high heat. Once boiling, lower the heat to medium and simmer for about 12 – 14 minutes until the rice is almost cooked with a slight bite. Remove the saucepan from the heat and drain the remaining water. Fill the pan with cold water to rinse off the starch and stop the cooking process immediately, then drain all the water again. Set the rice aside to cool completely. Meanwhile, prepare the tofu and vegetables. In a large wok, add 1 tablespoon coconut oil. Add the diced tofu and pan-fry until golden on every side. Toss and stir occasionally for even cooking, about 5 – 7 minutes. Next, add the vegetables at 2 minutes interval starting with the carrots, then green beans and Brussels sprouts, and lastly the sweetcorn. Toss and stir fry for a few more minutes then remove from the pan and set aside. Add one tablespoon oil in the same pan then add the garlic and spring onions. Saute for about 1 minutes then add the crushed/blended tomatoes. Simmer while stirring until tomato becomes a thick paste. Next add in the thyme, bouillon powder, paprika, chilli powder and oregano. Stir and mix well. Add about ⅓ of the cooled rice. Toss and stir to coat every grain of rice with the tomato mixture. Once well mixed, add about ½ of the remaining rice. Toss and stir again then add the remaining rice. Sprinkle on the nutritional yeast and drizzle the maple syrup. Add the vegetables and tofu to the pan. Toss and stir. For extra cheesiness, add some grated vegan cheese during the last minute of stirring and stir fry as cheese melts. 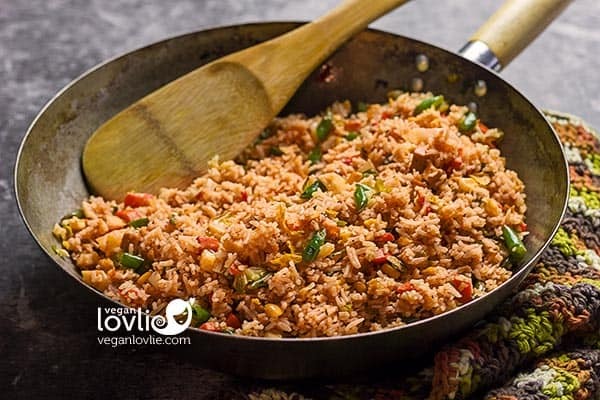 Love this Vegan Cheesy Nooch Tomato Fried Rice recipe? Pin it for later.